Hitting the gym with my girlfriend is an embarrassing affair. Not because she lifts almost as much as me, but because she’s so much better at it, with the all the right form and stuff. It gets tedious as she makes sure I use the proper technique every single time, but her gripes and coaching are about to get replaced by a new wearable called Gymwatch. 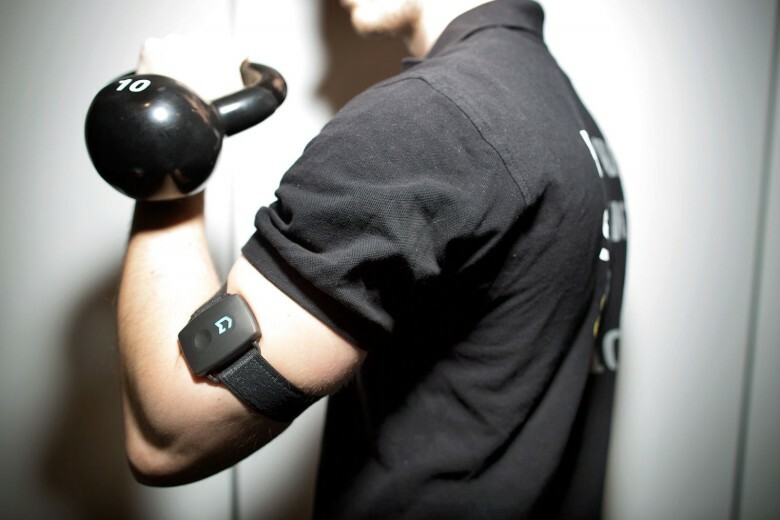 It tracks all your movements in the gym to make sure you’re getting the most out of your lifting workouts. Gymwatch is fitness sensor for muscle-heads that precisely measures the full range of motion and strength expended in every exercise, then provides personal coaching to help lifters maximize their results. Gym rats can strap the device to either their arms or legs, then fire up the app to go through one of the 900 exercises to see stuff like whether they’re doing bench presses too slowly or overextending on kettle bell squats. The sensor is a bit bulky, but it packs 30 days of battery power, which should cover an entire month of workouts. The price tag comes in a bit heavy at $200, especially considering Gymwatch competitor Moov only runs $89 per unit. But fitness buffs will appreciate Gymwatch’s advanced measurements for strength, maximum strength, explosive strength, speed strength and amplitude. It can count your reps, distinguish partial reps and serve up personalized exercise plans so you get ripped as quickly as possible.